Posted on October 19, 2012 by Susan H.
My eldest son, Michael, turned 16 this summer. Living the life of a teenager…he looks forward to playing house league hockey each week, shares a paper route with his younger brother, Matthew, spends his extra time playing road hockey or basketball with his brother and friends, or disappears to the ‘man cave’ to play videos. Along with the ‘fun teenage stuff’… first and foremost, comes school. Michael worked hard at school last year to achieve an Honours average in Grade 10…my husband and I are so very proud…it has been quite the journey. Michael lives everyday with multiple food allergies, asthma and eczema. A fact he would love to forget…love to see disappear…love for me to stop talking about. This is worrisome for me. According to an article written by Gwen Smith, editor of Allergic Living Magazine, Dr. Antony Ham Pong states, ” For the life-threatening allergens the highest risk of dying is as a teenager.” The article goes on to state that teenagers “act impulsively and sometimes take risks.” Dr. Ham Pong states, “There is a feeling of invulnerability that teenagers tend to have…if you ask them what the risks are, they know. But are they concerned? Not so much. It does not register with them.” Click here to view the entire article. I understand that, as a teenager, Michael just wants to fit in. However, the reality is he is living his life with a life threatening condition…one that should not be taken lightly. I am currently walking a fine line…establishing a safe environment within his school setting without centering Michael out within his peers. This year, I find myself treading in the ‘unchartered waters’ of the teenage years. MIchael’s Vice-Principal came up with the idea that I prepare an allergy friendly treat for Michael to enjoy after The Honours Night ceremony. The Vice-Principal presented the idea to the teacher who was organizing the event and advised me to contact them. The teacher was more than pleased to prepare an allergy friendly treat, however, after discussing cross-contamination issues, it was agreed that I would prepare the treat. Unfortunately, Michael did not feel the same way…he would prefer that I forget the whole idea…he did not want anything made. Honours Night was all about celebrating those students who have made the effort to achieve a high standing average at school. It was a night to celebrate Michael’s academic achievements. Keeping that in mind…I wanted Michael to feel comfortable. I wanted him to enjoy the night. I wanted him to feel proud of his achievement…to know how proud my husband and I are that he reached his goal. I wanted to honour Michael’s feelings…I did not feel I should compromise his night. I wanted him to experience ‘feeling like everyone else’…I chose not to bake anything allergy friendly. The teenage years is a hard time to embrace one’s uniqueness. Stepping back, I know this was the right decision. How do I prepare my children to be independent, cognizant, productive members of society? How to I prepare my children for the insensitivities of those around them? I believe, building my boys’ sense of pride, self-worth and self-esteem is fundamental in a world where compassion may be lacking. At the same time, I also believe educating the general public with the basics of anaphylaxis and the proper administration of an epi pen to be vital first aid knowledge. Click here for Anaphylaxis Canada’s post on ‘Understanding Anaphylaxis’. Anaphylaxis Canada maintains and operates, Why Risk It? Where Real Life and Allergies Collide. A site dedicated for teenagers with food allergies at risk for anaphylaxis. Click here for a link to the site. With stories of bullying, carrying an auto-injector (epi pen), cross-contamination, dating, dining out, partying, public places, reading labels, school, and travel…teenagers are presented with other teenagers experiences leaving them feeling less alone. Click here for a link. Why Risk It? even has a blog…‘written and maintained by members of Anaphylaxis Canada’s Youth Advisory Panel, a group of allergic youth from across Canada.’ Click here to view. I will continue to tread lightly during these teenage years , being careful of that fine line…spreading the word on anaphylaxis and listening to my boys’ needs without losing sight of the potential danger of apathy on their part. P.S. Needless to say, it was a great night! Inspirational Keynote Address by a former student who is now an English/Dance teacher at the school (Michael’s current English teacher), beautiful soloist by one of the students and an amazing motivational video that we all felt was outstanding! How are you handling the teenage years with your teenaged child/children with food allergies? 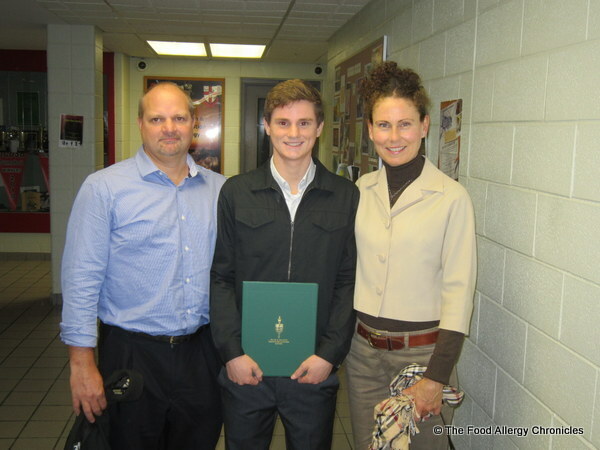 This entry was posted in coping with multiple food allergies, multiple food allergies, school and tagged anaphylaxis canada, the teenage years and multiple food allergies, Why Risk it? by Susan H.. Bookmark the permalink. Congratulations to your honor student! Congratulations to you on your restraint and respect for Michael’s wishes to not cater the celebratory event. I am sure your cake would have beaten the other cake, hands down! But sometimes that isn’t what matters to our kids, sadly. Count on me as one of your ‘momrades’ holding your cyberhand through these teenage years. My Michael is 14, and we are experiencing the same balance between fostering independence and protecting our son. (His food allergy list is similar to your Michael’s.) My husband and I do hope to instill pride and self-worth and the courage to stand up and take care of his needs through these years. I try to cast the protective net in ways unseen; for instance, I chaperone the marching band on away games so I will be there if something happens, and I bring safe snacks. You’ve both done a wonderful job with Michael! 🙂 Congratulations & I think it’s wonderful that you’re always willing to help out & do whatever needs done, or not done in this case. 😉 You’re a fabulous mom! Thanks Carla! It means a lot coming from you…I really respect your ability to manage your finances, food allergies, side jobs and the raising and educating of your children! You certainly are up for ‘Mother of the Year’ in my books! You have good timing; my “little” guy with allergies turned 13 yesterday! I agree that it is scary. I look forward to learning much more from you. Navigating the teenage years is certainly a work in progress! Matthew is right behind Michael, turning 14 in December! My husband and I have our work cut out for us! lol Happy Birthday to your son!